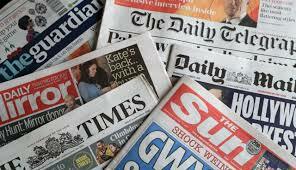 The Media Report the News, but do they miss the Big Story? 101 cyclists killed last year, 18,220 seriously injured. Don’t just blame drivers. But does that mean that drivers are to blame? Is this all due to austerity and cuts? But let’s get back to ‘cyclists and motorcyclists were 63 times more likely to be killed or seriously injured than car drivers.’ Blood on the roads, and much work for a cash strapped NHS and its A & E units that they could well do without. What does this tell us? Simply that urban cycling in the UK is highly dangerous. The mothers who don’t let their kids cycle to school are right. Sunderland is much wiser than Newcastle. As I drive past my old school on Humbledon Hill to my weekly Rotary meeting, there is no cycle lane where once I cycled. Gateshead is wiser too. Outside the Sage, the International home for music and music discovery enjoyed by thousands, there are no cycle stands. The access roads there are too narrow and hilly to accommodate cyclists, let alone a cycle lane. OK, try and make cycling a bit safer if you can, but the unguarded moment – for anyone, cyclists as well – can be fatal. The millions of pounds spent on 20 mph signs to make roads safer for cyclists hasn’t even scratched the surface of the problem. So, what of the response from the Department of Transport today? A two-year action plan to make cycling and walking the ‘natural choices’ for all short journeys by 2040, which encourages the reporting of anti-social driving but not anti-social cycling. They advocate penalties for drivers if they don’t keep their distance when overtaking cyclists, but what about cyclists overtaking motorists, and damaging wing mirrors? And there is no mention of compulsory insurance for cyclists. The root cause is never addressed, letting cyclists think that they have an equal right with other road users to drive on a narrow, busy, congested urban UK roads and, for everyone else, a responsibility to ensure their safety; claiming at the same time, that it is healthy to breath in toxic fumes from slow moving traffic. Promoting it on busy urban streets is totally misguided, trying to make it safe is a futile hope. For all those who have been killed or seriously injured their ‘human right’ has been a curse not a blessing. That is why I tell the story of the proposed cycle lane for Gosforth High Street in Newcastle. This is where it started for me. A black line on a map! 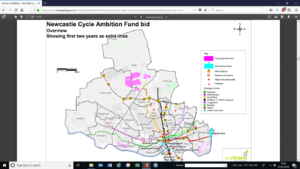 The cycling lobby, Sustrans, hired by Newcastle City Council to bid for the money to pay for cycle lanes draws a straight black line to show where they will go. That was the easy bit. They totally ignored the road conditions, their narrowness, the bus lanes, bus stops, pedestrian crossings, roundabouts and road junctions, and congestion. So, we end up with non-continuous cycle lanes, like bits of spaghetti on the landscape, and the charade of pre-determined consultation. Sustrans, as a cycle lobby is totally over the top, but as a road planner totally useless. The coming autonomous, electric car is not even in their line of vision. Likewise, giving the right of children with special needs to go to mainstream schools and closing 100 special schools was a curse and not a blessing. That the number of prescriptions of Ritalin for Attention Deficit Hyperactivity Disorder (ADHD) has increased from 700,000 to 1.5million in a decade is a sobering fact. This story has been on my website for over ten years. The Times Educational Supplement reported the rehearsed reading of my play Death of a Nightingale at the New End Theatre in London but when they realised that it was all about the closure of special schools, became silent. Meanwhile the Stage Magazine chose a Trot to review it, using acid not ink. This is the story the media has missed since the 1980’s and ’90’s. It is the story of dashed hopes: the hope that a civilised State will provide for children with Special Educational Needs under the umbrella of individual mainstream schools. The hope that it will enable you to cycle safely wherever you want to go. The hope that by giving you the right to these things, they will all happen. They never see the multiplicity of special educational needs – never see the multiplicity of road users and the variety of road conditions. They never see the impracticability of their dreams. Meanwhile, they denigrate the dignity of difference, while hailing ‘diversity’ and the ‘pursuit of excellence’ – both at times totally incompatible with equality. But the really big story is more than that. For some people the word impracticability does not exist; for lawmakers it is supremely irrelevant. The word impracticability is not in their vocabulary. They borrow, print or steal the money. And the latest wheeze? Quantative easing – so nothing is impossible. They mean well, but create absolutely nothing, only hopes and rights.